If you’re a semi-regular reader, or if you’re a follower on any of my social media accounts, you’ve probably noticed something about me: I write. A lot. Like, every day. I suppose that’s not an entirely unique quality for a writer to have. But I’m sure, for some who do follow me, it’s annoying. Or weirdly inspiring. Or I’m just putting words in your mouth again. Sorry, my bad. Maybe you’re one of those who wonders how I do it—write so much, I mean. Honestly, I’ve been waiting for the chance to let you in on a few of my secrets. Once again, Darren Rowse has pushed that door wide open. Today, I’ve been challenged to be honest. To show you how I balance my life as an aspiring, apparently prolific writer with, well, everything else. It’s not easy to wake up and decide you’re going to write an article, a blog post and a few good tweets (what? That takes some effort). Sometimes you just don’t feel like it. Honestly, lately, I haven’t felt like it at all. Yet I still post here daily, among other things. So what’s my strategy for overcoming the “I don’t feel like writing” mindset? Planning ahead. Come on, you knew that was coming. I plan my weeks out every Sunday night. I know when I have an article due and I make sure to work on it multiple days in a row, a little at a time, if I know I’m going to be swamped with other projects. I have some specific days on Novelty Revisions dedicated to specific topics (i.e., Solution Saturday, discussion days and my midweek novel updates). I always try to write 1,000 words of my book. I make sure I know what’s coming every day so that I’m ready, and motivated, even when I’d rather be doing something else. I’ll admit, it does get boring, writing what feels like the same thing over and over again. I don’t think I would be able to keep up a daily blog and make steady progress on writing a novel if I only stuck to those things, never branching out to do anything else. So I try to contribute regularly to multiple publications, such as Lifehack and College Lifestyles (I don’t write as much there lately, but I’m behind the scenes, trust me). Basically, I write anywhere I can, as often as I can. Does that take a lot of time? Of course. But it’s a lot easier to write a few paragraphs for one article, switch over to some fiction writing and then move on to pitching some new ideas somewhere else than it would be to just focus on one thing. I get a lot more done that way, and I’m less likely to suffer a gap in my productivity. “I’ll just write it later” is not a phrase I allow myself to use very often. Yes, school and work, relationships, keeping up with too many YouTube subscriptions—that’s all important. But writing is always near the top of my prioritized to-do list, if it’s currently not holding the top spot. If you want to be a writer, that’s just what you have to do. Look at John Green: he just started a social media hiatus to focus on writing for awhile. WHO DOES THAT? Someone dedicated to their work. Someone who recognizes how important it is. I live by the same philosophy—no, I won’t be going on a social media hiatus anytime soon. But my writing is like work to me. I do it every day because it is just as important to me as school or family or friends. If I have something temporarily more important to do, like study or go watch a soccer game, most of the time, I’ll put my writing aside for the time being. That might mean staying up later to get it done last, or waking up earlier to get it done first. It is that important to me. It’s not about writing when you feel like it or when you have a free moment. It’s about finding time to write regardless of what else might be going on. I find time daily. That probably aggravates some people. Fine. It’s not going to stop me from writing as often as I can, and you shouldn’t let anything stand in your way, either. 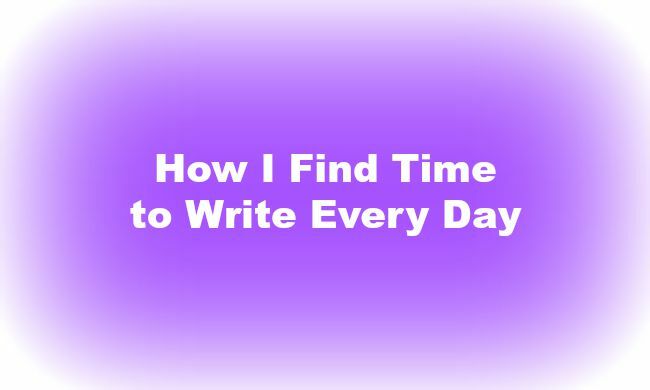 Maybe writing every day isn’t your thing. That’s okay. But once it becomes a habit, it’s kind of hard to function without it. Previous postWhen Is It Okay to Edit As You Write? I really like your way of doing things! I need to try it, too. I’d like to think of myself as organized and routinely, but with my writing . . . well, most often, I prefer to do it at nighttime, but that’s when my family’s free, so they always want to do things. So I don’t really feel like I can say no (and I do enjoy spending time with them), and my mom doesn’t enjoy me staying up late (still a high school student, heh). I suppose I should try and write more in the mornings. Or maybe do it in chunks, like I’ve heard lots of people do it, instead of all at once, like I usually do . . .